MOVE over Mulgowie Yowie. You are not alone. For the first time the QT can report on yowie sightings at Rosewood, Redbank and Yamanto as Ipswich strengthens its standing as a "yowie hotspot" amongst researchers. The famous yowie at Mulgowie may have the highest profile in the region but other mysterious hairy beastlike creatures of the bush are not going to be denied. Carlos Cabernet, a former resident of Flinders View, told the QT of the yowie that he saw and often heard on the Yamanto and Flinders View side of Deebing Creek while growing up in the region. "There was one particular time when I was 13 and camping near the creek bed and heard him in the early morning within metres of us," he said. "We jumped out of the tent and he was across the creek just looking at us with his beady eyes. "He was crouching down, very big...just a hairy fur ball mass. If he'd stood up he would easily have been eight feet. "He was so hairy that you couldn't determine too many facial features, but you won't forget those eyes once you've seen them. "I saw him another time when he darted behind trees at dusk. "He was always around, especially in the warmer months. "Quite often you'd hear him in the distance yelling out and going off. It was a screeching kind of yelp. No animal makes that noise. "We'd hear him for 13 years but towards the end of 1992 he was never heard of again." Researcher Ray Doherty has a blog called the Australian Yowie Project and has been fascinated by yowies for 20 years. Doherty said he'd had numerous subsequent encounters with yowies in the Sunshine Coast hinterland region but it was an experience near Rosewood, on the Mt Walker West Rd, that pricked his initial interest. "The very first experience I had with what I believed to be a yowie was in June, 1995 right near Rosewood on Mt Walker West Rd," Doherty said. "I used to be an amateur astronomer in the 1980s and 1990s and we used to go out through places like Rosewood and the foothills of Mt Barney where there is some of the best viewing in winter. "We'd pulled off to the side of the road, got our telescopes out and sat them on the top of the car to have a look. "It was around 1am and the wind had picked up and there was this really foul stench. "We thought that maybe there was a dead cow nearby. "Minutes later we heard close by an ungodly sound, a cross between a shriek and a scream. "There were four of us and we looked at each other and said, 'this can't be'. "The stench smelled like it was getting closer. We had some high powered spotlights and shone them in the nearby field where we saw the red eyes of the cattle, but then we spotted what looked like big yellow eyes. "We looked through binoculars and the eyes would change colour as the head moved. "Then we saw it stand up. You could make out the fuzzy shape of it and all of a sudden it rose up to stand seven or eight feet and started slowly moving towards us. "Then we took off, headed into Rosewood and discussed it. "We went back half an hour later and found no evidence of anything except a fence was pushed down in the same area." 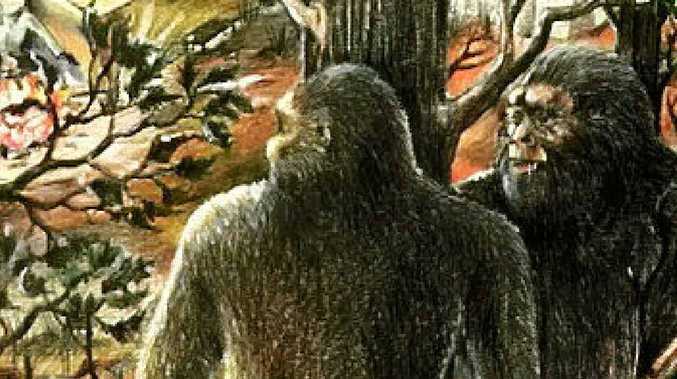 Doherty, who also spoke of an experience with a gorilla-like creature at Coochin Creek in 2012, has a most recent article on his blog about scientific analysis of an alleged yowie hair follicle which determined it belonged to a creature "right on the border of humans and apes". The QT sighted a top secret file on a yowie sighting in Redbank just a few months ago. A yowie researcher investigated the incident but has yet to release his full report publicly. But we have sighted an excerpt from the report which states that "today I spoke with a woman who claimed to have seen a yowie in bushland in the Redbank area". "Her sighting occurred close to residential housing in broad daylight and lasted about 12 minutes during which she watched a large hairy bipedal creature through binoculars." The researcher was in town to follow up the possibility that the yowie was in fact the Mulgowie Yowie, after the QT had reported earlier that another researcher had claimed it had "moved to Redbank Plains". This lines up with a possible sighting recorded in 1986 and first reported in 2001 by Dean Harrison's Australia Yowie Research website. If that was true, the yowie is unlikely to be the same creature said to roam Mulgowie. "Every few years someone comes up with a report from the Redbank Plains area, but God knows why," Harrison said. "The Ipswich area seems to be a yowie hotspot. There are so many out there, but to say it is just the one yowie is ridiculous." Doherty said when the existence of yowies is proven once and for all it would "open up a whole new range of academic and scientific study". "But more importantly we can then get their habitat protected. If we can prove that these things are real with hard science it will be one of the greatest discoveries in Australia's scientific history."